Villeroy and Boch Subway Infinity Rectangular Shower Tray with ViPrintFrom £939.60 inc.VATRectangular shower tray with a choice of 20 contemporary coloured and printed surface patterns, in 4 sizes. Villeroy & Boch Squaro Super Flat Rectangular Shower TrayFrom £1189.20 inc.VATRectangular shower tray available in 4 sizes. Villeroy & Boch O.Novo Quadrant Acrylic TrayFrom £213.30 inc.VATRRP: £284.40 (Save 25%)A 550 radius quadrant quarter circle shower tray by Villeroy and Boch, with waste, feet, support and anti-slip options. Villeroy & Boch O.Novo Square Shower TraysFrom £213.30 inc.VATRRP: £284.40 (Save 25%)Choose from 3 sizes: 800, 900 or 1000mm square. Options for anti-slip, support base, feet and 2 waste colours. Villeroy & Boch O.Novo Rectangular Shower TrayFrom £314.10 inc.VATRRP: £418.80 (Save 25%)Choose from sizes: 1200 x 900, 1000 x 800, or 900 x 800mm. Options to add a support or legs and a shower waste. Whether your bathroom environment is spacious or snug will impact your choice of shower tray, so you must first be aware that shower trays are available with a range of different dimensions. Furthermore, it is essential to be sure of whether your space suits a square tray or a quadrant tray, or whether a rectangular tray would be more appropriate for the area you’re working with. If you are looking to simply replace the shower tray you already have then it will be easy to know the exact shape and size you are looking for. Across the Villeroy & Boch range stocked at UK Bathrooms there are various sizes available, and designs in a square, rectangular and quadrant shapes. This buyers’ guide will consider other essential elements such as style, features and material. Initially, however, shape and size selection must be the primary focus. Knowing the size and shape you require is the foundation stone in the shower tray buying process, once you are clear as to your preferences and requirements on this front, other important decisions are ready to be considered. The incredibly elegant quadrant shaped shower tray is an option unique to the Squaro super flat range. This shape has one curved edge, the ideal option for a shower space in a corner, or for that slightly softer rounded look which may suit your stylistic preferences. As is evident from this breakdown of your potential options, the range of shapes and sizes available from the Villeroy & Boch range at UK Bathrooms is sure to cater to your needs. Price is reflected in the area of the tray selected. If you are still in the dark about which size and shape will work best within your bathroom space, it is wise to consider what style of door and shower frame are you working with. If your shower door has a pivot hinge there must be enough room for the door to open out into the room. You may have more flexibility and range in terms of space if the door you’re working with is a sliding door or a concertina type bi-fold door. If space saving is your priority, this should be reflected in your shower tray selection. If you are aiming to achieve a light, airy and spacious effect in a larger area bathroom space, then it would be wise to consider the shower trays with an area on the larger end of the scale. The majority of Villeroy & Boch shower trays featured in the UK Bathrooms range are flat. This means that they are not significantly raised above your bathroom floor surface. This flatness creates that ultra-modern walk-in shower effect. This sleek, futurist flat shower tray style is worth considering when planning your dream bathroom space. However, it is necessary to consider your practical requirements when choosing a flat or raised shower tray. You must be aware of where the shower’s waste pipe will be located and what drainage options you would prefer. If it is possible to get the drainage and waste pipe under the floor, a flat shower tray is a viable option. A shower tray with a designated waste area which allows space for pipes and wastewater drainage is a better option if getting the drainage pipe under the floor is not feasible. If your bathroom area is not wholly suited to an ultra-flat shower tray then the Villeroy & Boch Futurion range stocked at UK Bathrooms is a stylish and practical choice. The Villeroy & Boch Futurion flat rectangle shower tray is a highly adaptable option with the optional support base and waste area. 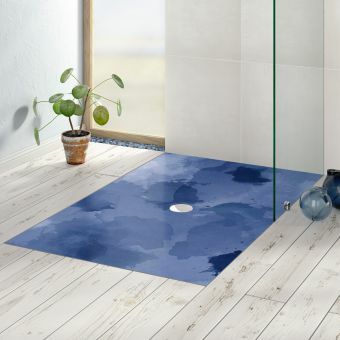 The Futurion Flat Square shower tray from Villeroy and Boch comes with the option of removable feet, again making it an adaptable option if you’re looking for that little bit of under tray waste water space. Aesthetically, both Futurion shower trays have an elegant circular drain. While being adaptable options to suit your bathroom drainage needs, the Futurion range has an ultra slim profile of only 17mm, making both the Futurion Flat Square and the Futurion Flat Rectangle Shower trays sleek and stylish options, perfect for a minimalist bathroom. Both the Villeroy & Boch Squaro shower tray and the Villeroy & Boch Squaro Super Flat shower tray, come with an integrated drain and cover, a flexible drain connection and adjustable feet. Having selected the shape and size you require, you can rest assured the Squaro range proves a flexible, adaptable option to suit your undertray and drainage requirements. 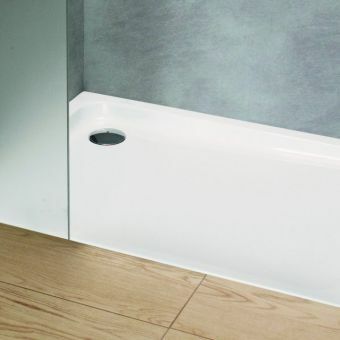 The Squaro shower tray features a twin drain when you purchase one with an area greater than 1200 x 900mm, and both the Squaro and Squaro Super Flat boast an attractive rectangular drain, perfectly in keeping with an angular bathroom space. Similar to the Futurion Range, the Squaro range offers practical adaptability while being a wonderfully stylish option. The Squaro range is perfect for achieving a futuristic look for your bathroom, the ultra slim profile allowing for that seamless walk-in effect. 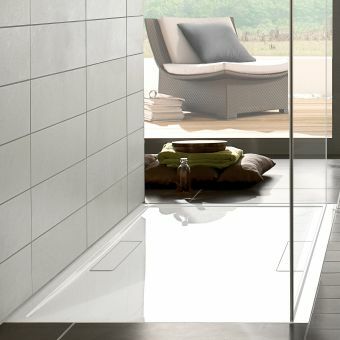 The elegant shower tray choices from Villeroy & Boch are the epitome of practicality and elegance. Their inimitable blend of functionality and style is largely due to the unique material Villeroy & Boch uses to create these excellent products. 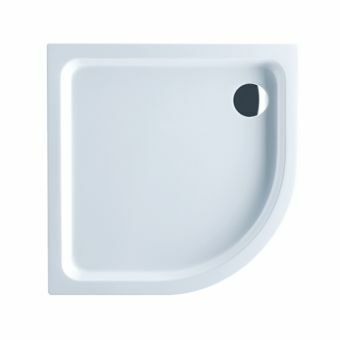 Each of the four Villeroy & Boch shower trays in UK Bathrooms' select range is made from Quaryl. Formulated exclusively by Villeroy & Boch, Quaryl is a unique blend of natural quartz zone and acrylic resin. The material is extremely durable and compact, and therefore a perfect option for creating bathroom features. You will not have to spend hours scrubbing the limescale from a Villeroy & Boch shower tray. The pore-free material is easy to clean, perfect for creating your ideal bathroom escape, or a sparkling place for your guests to unwind. Quaryl is also shock, impact and scratch proof, so there won’t be any unsightly dents or scrapes. Villeroy & Boch also take those all-important safety concerns very seriously. Quaryl has been TUV/LGA tested and approved as a slip-resistant material. As well as these practical benefits, Quaryl also appeals because it of its excellent heat insulation qualities which result in a pleasantly warm to the touch surface, ideal for those bare feet. All the of the Villeroy & Boch shower trays featured on UK Bathrooms are made of Quaryl so you can be sure whatever dimension, shape and drainage options you select, you are guaranteed to have a shower tray made from this state of the art material, unique to Villeroy & Boch. The Villeroy & Boch shower tray collection available at UK Bathrooms offers a choice of chic, high-quality products, perfect for your bathroom’s aesthetic and practical needs.